It is that time of the year again: toward the end of a fiscal year, which ends on September 30, unused EB1 visa numbers will “fall down” to lower preference categories. The Department of State (DOS) recently advised AILA that approximately 12,000 EB1 visas remain unused. This figure is higher than usual, so it is no surprise that DOS may begin to release the excessive numbers next month, in the May 2011 visa bulletin. EB2 categories are obvious beneficiaries, with EB2 India expected to consume more of the “fall-down” visa numbers. The reason is that unused visas must be re-allocated based on priority date. Since India is more backlogged than China, visa numbers must go to India nationals with the earliest priority dates first. When the two countries reach similar cut-off dates, any remaining visa numbers will be split between China and India EB2 applicants. This trend can be seen on our visa bulletin graph. In the past few years, India EB2 usually lags China, until July or August when EB1 numbers become available. 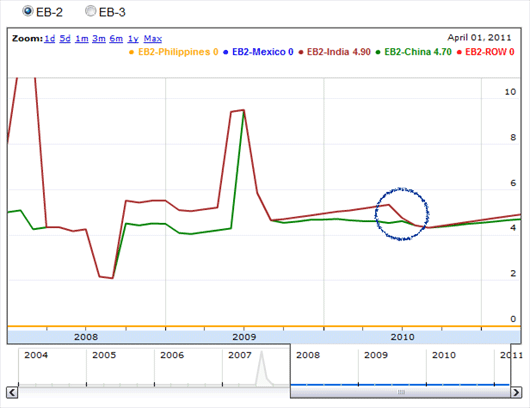 The curve for EB2 India would drop faster, and eventually meet EB2 China. Then both would advance, albeit slowly, and start to separate in a new fiscal year with India becoming further retrogressed. Unfortunately, EB3 categories, which are facing worse retrogression than EB2, will not be able to benefit from the unused EB1 visa numbers. It is unclear how fast EB2 will advance in coming months. Hopefully at least six months before the end of FY2011. We’ll find out soon, as the May visa bulletin should be published around April 10th or so, less than two weeks away. For those of you who are getting close, good luck! This entry was posted in Green Card, Visa Bulletin. Bookmark the permalink.